Best grown against a sheltered south-facing wall in the cooler climates. Elsewhere apricots need full sun to limit disease and produce high quality fruit. Feed with balanced organic fertiliser in early spring. Keep the area beneath apricots mulched with wood chips, straw, or another mulch that helps maintain soil moisture. Prune in spring or mid to late summer in cooler climates. Elsewhere prune apricots in late winter. Healthy apricot trees will bear for ten to fifteen years or more. Dieback and oozing resin can often be remedied by improving growing conditions. Mulching, watering, feeding, weeding and hard pruning can all help. 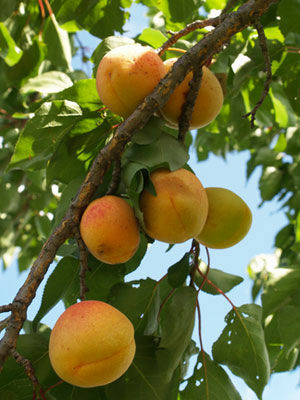 In humid climates, apricots often develop problems with fungal diseases such as brown rot. Preventive sprays with organic fungicides are often needed to grow good quality apricots.